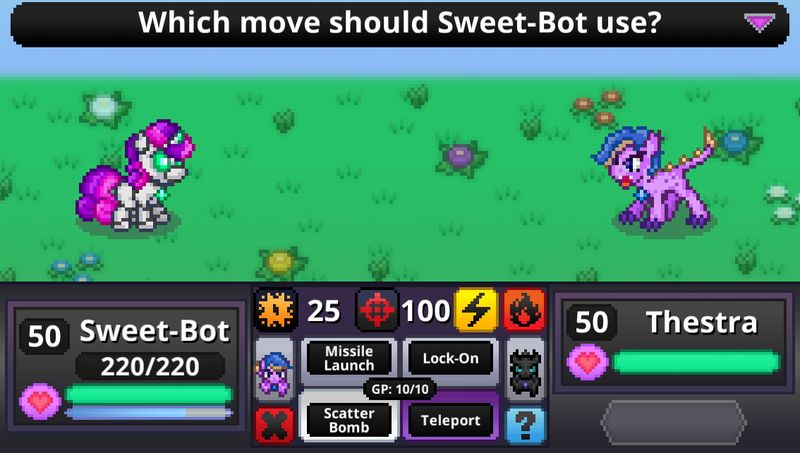 Vibrant backgrounds are a pretty important part of the battle scenes in Battle Gem Ponies. It took a bit to get the feel just right, but this is how I pictured the Meadow Battles in my head. A Grassy plain with scattered flowers and weeds. I still have to add slow moving clouds to the sky in the back but I've been focusing on battle engine bugs lately. 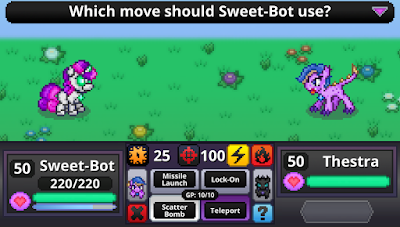 The backgrounds are made by simply making a 346x128 rectangle, splitting it in half, making the bottom a solid ground color, adding subtle gradients to the sky and ground, blurring the horizon line, tossing on foreground sprites (and other details), blurring out the sprites softly, then making the foreground and detail sprites halfway transparent. The result is a background that pops but is noticeably less attention grabbing than the sharp, solid-colored, animated sprites that are the ponies. I plan on using a similar design for all the backgrounds. A recolor of the ground and horizon mixed with new foreground elements and some subtle animated touch. I need backgrounds for the desert, different caves, indoors, in a forest, by a creek, atop a mountain, and many other places. Now that I have a system for it though, it's much less overwhelming than it sounds.